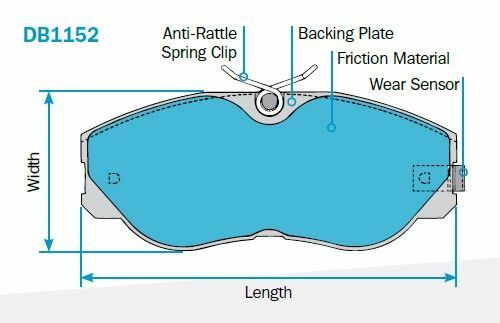 Two of the most common reasons to measure a disc pad are: Pad identification; and pad wear checking. This bulletin will discuss some important concepts for each of these tasks. 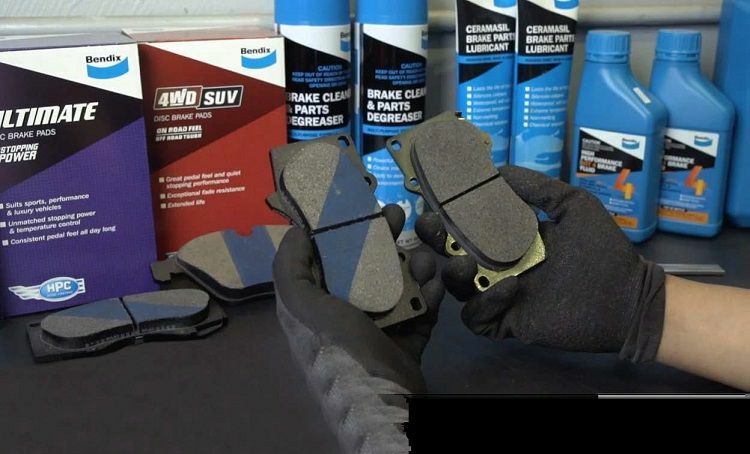 Pad Identification is a crucial step in any brake job, particularly now when some vehicles can be fitted with several different brake options and vehicle owners have greater access to aftermarket brake upgrade kits. The brake fitter needs to confirm that the new pads are the same part as the old pads. Sometimes a visual inspection, or back-to-back comparison of the pads is enough to identify a difference, other times when the pad shape is the same a couple of simple measurements will verify the part. 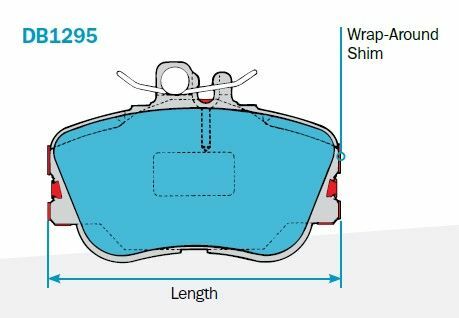 Pad Wear checking is a most useful tool, not just to show when to change the pads, but to pick indicators of problems throughout the vehicles braking system. 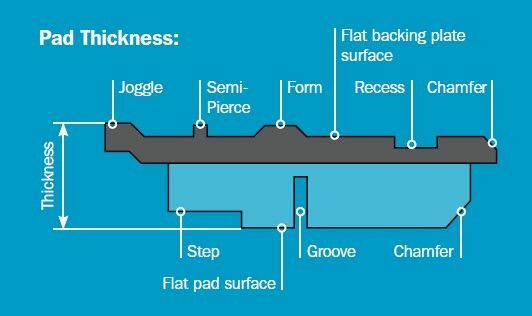 The key features of a pad needed to identify it are Shape, Length, Width and Thickness. The Bendix website and latest Bendix printed catalogue give the information required for positive pad identification. The below example of a DB1152 for the Nissan 300ZX shows how to measure a pad that has additional accessories fitted. The Pad Length is the total length of the Backing Plate and Friction Material not including any overhanging clips. In the example measure from the left edge of the Backing Plate to the right edge of the Backing Plate not including the Wear Sensor. The Pad Width is the total width of the Backing Plate and Friction Material not including any overhanging clips. In the example the pad is measured from the bottom edge of the Backing Plate to the top edge of the Backing Plate not including the Anti-Rattle Clip. On some pads the shim on the backing plate wraps around the ends of the pad increasing its effective length, shown below in red on DB1295. In these cases the Pad Length is the total length of the Backing Plate including Shim. The Bendix Website and Bendix Catalogue have a section that shows what the disc pad set consists of, including the measurements. Read the measurements as Length x Width x Thickness. Note some sets have different size pads in them, in this case both pad sizes will be shown. The Pad Thickness is the total thickness from the flat surface of the Backing Plate to the flat surface of the Friction Material. This exaggerated example shows all the common features found on the Backing Plate surface and the Friction Material surface, this is a made-up example just for demonstration purposes, thankfully there are no real pads that are this complex. Remove any clipon shims before measurement, but where Shims or Gaskets are attached to the back of the Backing Plate include them in the thickness measurement. During the braking process the friction material and brake rotor absorb large amounts of heat. The friction material also acts as an insulating barrier to slow the heat transfer to the brake caliper and other components. As the pads wear there is less friction material so more of the heat is transferred to other components. It is recommended that the brake pads be replaced when there is less than 3mm of friction material remaining. Note the position of each pad as you take them out of the brake caliper, also note any broken spring clips or shims that come out. Measure each pad at several positions along its length. In many cases the jaws of your measuring caliper can reach right across the width of the pad. Differences in thickness in a single pad of more than 0.5 mm can indicate a problem with the caliper, requiring a caliper service, recondition or replacement. Even if the pads have worn evenly with no taper they can still tell a story. The differences in thickness between pads can also indicate caliper problems. Outer pads worn more than inner pads in a single piston floating caliper can indicate the floating caliper is binding on its slides either through excessive wear or lack of lubrication, so after a brake application the piston retracts but the outer pad is still held in contact with the disc. To help prevent binding, always clean the caliper slides with Bendix Brake Cleaner, and lubricate with Bendix Brake Lubricant. Wear of both pads on one side of the vehicle could indicate the piston is unable to retract, possibly due to corrosion or a damaged rubber piston boot. If the piston is unable to retract, both the pads will be left contacting the disc after each brake application causing rapid wear, the driver may experience the vehicle pulling to the damaged side for a while after the brakes are released. In extreme cases of piston binding the piston may not be able to move at all, causing the opposite wheel to do much more of the braking, wearing its pads prematurely and potentially causing the vehicle to pull to one side during braking. To help prevent corrosion, always bleed plenty of the old heat affected brake fluid out during a brake job and top up with quality Bendix brake fluid. I learned most of this many years ago while working in Spare Parts. Very useful information.